The head of a Palestinian terrorist group in Lebanon said he would like to see Iranian soldiers take part in an “all-out war” to liberate Palestine, and that the future Palestinian conquest would include an invasion of both Israel and Jordan. Ahmad Jibril, leader of the Popular Front for the Liberation of Palestine-General Command, told Hezbollah’s Al-Mayadeen TV on February 17 that his group wants “to see the revolutionary fighters from [Iran] in the Galilee.” His remarks were translated by watchdog group MEMRI on Friday. He added that “The war with this enemy will be an all-out war… in the Golan, in South Lebanon, in the Galilee…[and] will be waged from Rosh Hanikra to Aqaba. During a television interview with Iran’s state-run Islamic Republic News Agency, the terror chief repeated a previous threat to fire rockets at Israel’s nuclear reactor in Dimona and at a huge ammonia storage tank in Haifa. Hezbollah will not keep to any “red lines” in a future war with Israel, Nasrallah cautioned. “In the face of Israel’s threats to destroy Lebanon’s infrastructure, we will not abide by red lines, especially regarding Haifa’s ammonia and the nuclear reactor in Dimona. Hezbollah possesses the full courage for this,” he said, according to an English translation of his comments reported by the Naharnet website. “We are not advocates of war. 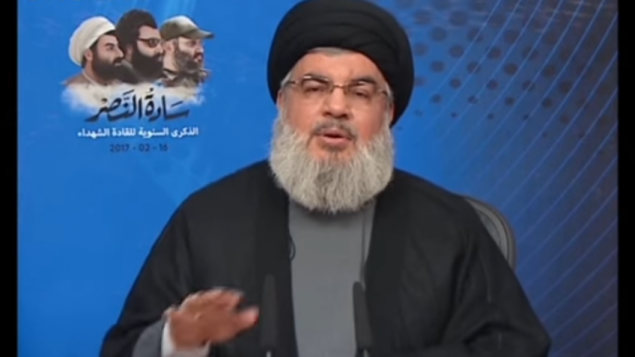 We are in the defense position,” Nasrallah said. On Thursday Palestinian Authority President Mahmoud Abbas sai during a visit to Lebanon that Palestinian factions were committed to preserving security in refugee camps around Lebanon.